A double DVD set to train Christian leaders and youth leaders - essential for churches to get the most out of the Freedom in Christ course. Lasts approx six hours. Filmed in front of live audience. * Introduces biblical principles involved in making fruitful disciples and shows how to implement them using the FIC Course. * Explains how to help every Christian mature and become fruitful much faster. * Equips people to win the spiritual battle and to take responsibility for their own spiritual development. * Includes tips for running the FIC and FIC youth courses, and for linking them with Alpha and other courses. 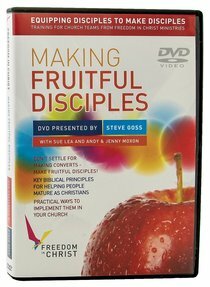 About "Making Fruitful Disciples DVD (Freedom In Christ Course)"